Enjoy a relaxing cruise on the Norwegian Epic by experiencing the biggest spa at sea. The Norwegian Epic impresses in every way. A family friendly, action-packed vessel with the best entertainment and cuisine you could possibly want. Picture your dream cruise holiday, and Norwegian Epic will be sure to make it happen. For a relaxing, peaceful journey, spend some time at the Mandara Spa, and let yourself be pampered and rejuvenated. Dine in the Great Outdoors restaurant and find incredible dishes from around the world while enjoying the fresh ocean breeze. The Norwegian Epic can be a place of adventure also. With a Multi-slide Aqua Park and bowling alley you’ll never run out of fun activities during your days at sea. Later in the evening experience the fun atmosphere inside the Epic Casino or attend a Broadway show in the world class theatre onboard. And whenever you need to, retreat to your suite, whether it be the private studio for solo travelers or the luxurious Haven suite. 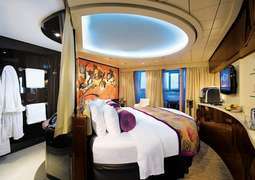 On board the Norwegian Epic, you will find a range of cabins and suites which blend comfort, style and value. No matter what your taste, you will find the ideal place to stay. From the smart and stylish inside cabins to the indulgent and luxurious suites, the perfect place for you to call home is waiting on board for you. The pinnacle of living on board is the Haven class of suite, with floor-to-ceiling windows providing sensational views, a spacious and comfortable living area and a butler to look after your every need. For a relaxing and peaceful cruising experience, the Spa class suites are the place to go, with a hot tub in your suite and exclusive access to a range of lounges, treatments and spas. A wide range of culinary options are available on the Norwegian Epic, with everything from buffets and on-the-go choices to the two main dining rooms. 'The Garden Cafe' whips up fresh omelettes, pasta and more for you to enjoy while taking in magnificent sea views while 'Shanghai's' Chinese Restaurant and Noodle Bar give you a taste of the East in a friendly and welcoming atmosphere. In the stylish and contemporary main dining room 'Taste' you will find a varying menu with chef's signature dishes and wine recommendations which will ensure a dining experience not to forget. The non-stop eatery 'O'Sheehan's' will provide you with American classics and comfort food favourites to enjoy in an inviting atmosphere, complete with a bowling alley. You will find a wide range of ways to keep yourself entertained throughout your time on board the Norwegian Epic. There is a large number of shows and performances like 'Burn the Floor', where an international cast performs an array of different dances like Grand Viennese waltzes and tangos. A one-of-a-kind theatrical experience is 'Cirques Dreams and Dinner', where you can enjoy world-class acrobats and aerialists serving up an entertainment extravaganza while you dine on a highly enjoyable meal. In the bars and lounges on board you will find the perfect place to enjoy an evening drink. From the cool 'SVEDKA Ice Bar' to 'Maltings Whiskey Bar', there is sure to be a place for you to relax and enjoy yourself with friends. There are plenty of activities on board sure to keep you busy for the duration of your cruise, no matter your age. There is plenty of fun on board for the younger passenger, with the Aqua Park Kid's Pool and Entourage Teen Centre just two examples of this. A range of facilities will keep your heart pumping on board, like the fitness centre, sports complex and the jogging track circling the ship. For a wind down after all this movement the Mandara Spa will be on hand to pamper you with hot stone massages, rejuvenating facials and more. Tech lovers will not be disappointed on board with a video arcade, Wii wall and iConnect Internet Cafe to keep you busy. For the risk taker, the Epic casino will be a chance to test your luck on games like poker, black jack and more. As the name suggests, this is a ship of epic proportions. One whose every aspect screams grandeur. Try this for size: Norwegian Epic weighs a staggering 155,873 tons, has an overall length of 1080 feet and has a guest occupancy of 4100. 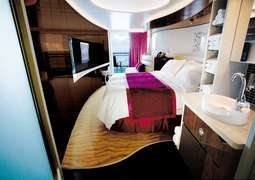 Apart from the sheer size of her, Norwegian Cruise Line’s Norwegian Epic is a ship of innovations and re-imaginings. She cruises Europe’s beautiful waters year-round and subsequently has an extensive armory of amenities and facilities to entertain passengers, whatever the weather. Let’s start with a few of the daytime entertainment options. There are various activities available inside the Epic, such as an internet café, a video arcade, duty free shopping in The Marketplace, and a large art gallery simply called The Collection. It is also worth stopping by the Click Photo Gallery for a chance of spotting your own photographic efforts appear on the screens! For teens, the Entourage Teen Centre is a guaranteed hang-out area. Designed as an adult lounge, only minus the adult invites, this is a laid-back area which turns into a teens-only nightclub at night. When it comes to health and fitness onboard the Norwegian Epic, you will not want for options. The Mandara Spa offers a complete spa menu in the fullest sense of the word, where you will re-emerge with a soothed sense of mental and physical wellness. Some of the spa treatments that you wouldn’t ordinarily expect on a cruise ship include acupuncture, botox, and teeth whitening. Meanwhile the Pulse Fitness Centre is open 17 hours a day and offers daily aerobics and fitness classes alongside the full repertoire of gym equipment. There is also an outdoor jogging track so that you can enjoy some bracing fresh air as you take a morning run. Holiday onboard the Norwegian Epic and you will return back home looking and feeling a million dollars! There are six outdoor hot tubs dotted around the ship for the ultimate spot of private relaxation. Norwegian Epic’s exhilarating Aqua Park is the place to head for some family fun splashing around on deck – choose between two pools, five hot tubs, three multi-storey water slides, and the thrilling 200 foot Epic Plunge, which also happens to be the only bowl slide at sea. For some adults-only poolside entertainment, the Spice H²0 beach club offers exclusivity and exotic cocktails.